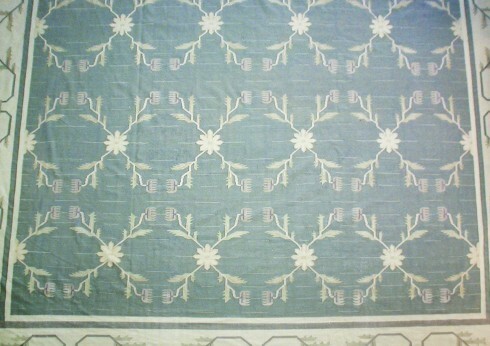 THE DHURRIE RUG - From the older tradition of rug-making in India. The textile art of India has long been admired for a natural use of color, pattern, and texture that seems to spring from the landscape and history of the continent itself. The grandest examples of this art have roots in the early 16th century, the country’s age of empire, when the Mughals consolidated control of the continent and created elaborate textiles to serve as centerpieces in their religion, ceremony, and newly settled way of life. Stories and paintings from the period depict the emperor Akbar leading his enormous caravans across the country, carrying with him, even in war, astonishing collections of tapestries and majesterial rugs. But long before Akbar and the Mughals, India had been home to a simpler, older tradition of rug-making. 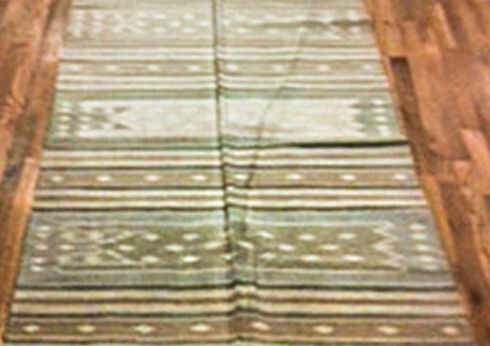 Alongside the enormous carpets made of the area’s finest materials by professional craftsmen for use in art and ceremony in the courts of emperors, the nomadic herding tribes of India continued to practice the “flat weave,” one the earliest known rug-making techniques, with origins traced to ancient Egypt. Flat weave carpets, made without the use of pile or backing, consist of horizontal threads woven over and under vertical threads. They are tightly-woven, reversible, and remarkably tough. In India, the carpets are known as Dhurries. The Dhurrie rug has a long history linked closely to the history of India. In the beginning, their design was simple: usually woven from cotton, sometimes from wool, they were constructed for daily use. The original Dhurries, precursors to those we know today, had minimal decoration: simple patterns of colored stripes against white backgrounds. Sizes ranged from the very small (to serve as bases for valued objects) to the very large (to serve as flooring.) The simple, but extremely versatile Dhurrie rugs were utilitarian objects, the workhorse textiles of nomadic cultures. As India transitioned from nomadic to settled life, Dhurries became integral parts of the village home. The durable and affordable rugs were used as ground covering, insulation, and bedding. Dhurries even served a vital role in traditional ceremony: smaller rugs, known as Aasan, were used for meditation. And in marriage, the rugs became a major component of the dowries offered with wives. In the grandiose courts of empire, too, Dhurrie rugs featured prominently. In Akbar’s famous military campaigns, they served as ground-cover for camped armies. 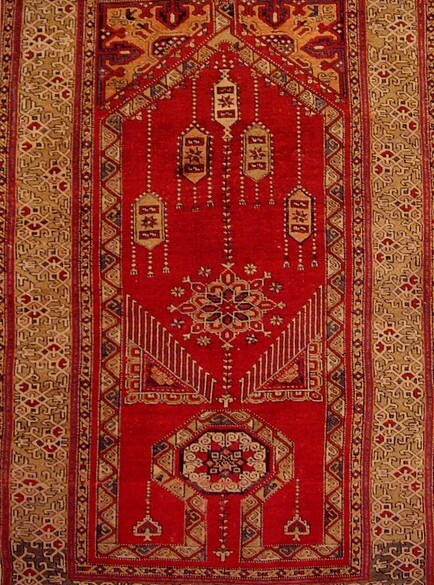 Paintings from the period depict the rugs in palaces, where they were used as foundations beneath the more expensive and elaborate knotted rugs on display. The Dhurrie continued to evolve with the rise and disintegration of colonial India. With the British colonists came industrialization and the manufacture of the perennially hardy Dhurrie rug became a project for enormous mills that could churn out product cheaply and at enormous scale. As a response, traditional Dhurrie craftsmen transformed their trade. To distinguish their rugs from the mass-produced products of mills, they learned to incorporate elaborate patterns and brilliant colors never seen in the utilitarian Dhurrie rugs of history. These patterns drew heavily from the art of India’s native cultures, first among them the early Indus Valley civilizations. Contemporary Dhurrie rugs retain the traditional strong and simple weave that has made the carpets so astonishingly tough and durable—able to withstand life in nomadic cultures, villages, and empires. Hand-made locally in villages, Dhurrie rugs have become a vital part of local Indian economies. They are made all across India, from Darjeeling to Rajasthan, with each region incorporating its own local colors and geometric patterns. In northern India, and in the Punjab region in particular, entire communities of Dhurrie collectives have arisen to support the local artisans who, evolving with a changing continent, have transformed the utilitarian Dhurrie rug into the tough and beautiful masterpiece we know today.